Renting a storage unit is a smart way to keep your home or business organized. Self-storage spaces can quickly become overloaded with boxes or items, if the renters don’t have a plan in place. For short-term storage, arbitrary stacking will cost you more time in the long run. Finding something specific becomes a major ordeal – and, in some cases, an avalanche of falling boxes! 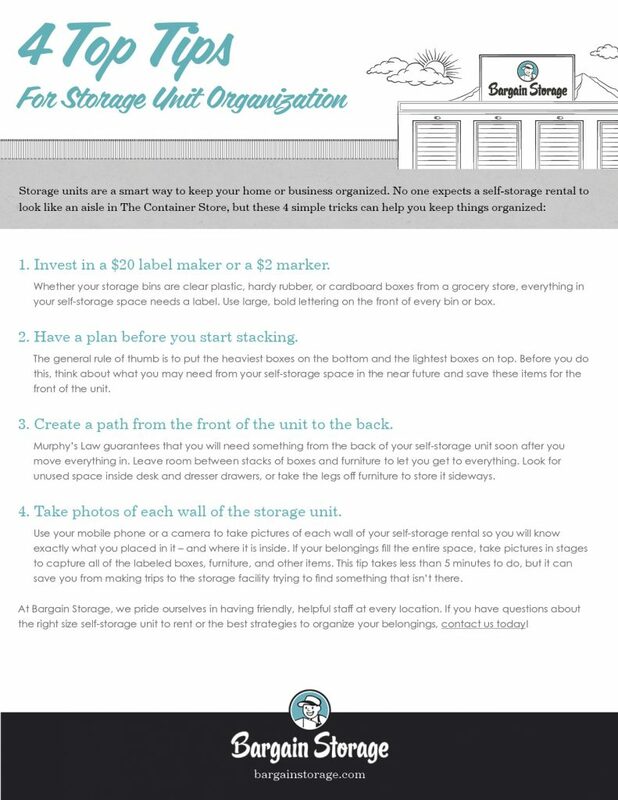 No one expects a self-storage rental unit to look like an aisle in The Container Store, but a few simple tricks can help keep things organized. View our checklist below and download the PDF here. 1. Invest in a $20 label maker or a $2 marker. Whether your storage bins are clear plastic, hardy rubber or cardboard boxes from a grocery store, everything in your self-storage space needs a label. Use large, bold, easy-to-read lettering on the front of every bin or box. This effort will save you plenty of time whenever you need to find something. 2. Think about what you might need in the near future before you start stacking. The general rule of thumb – and the safest way to stack boxes – is to start with the heaviest ones on the bottom and work your way up so the lightest boxes are at the top. Before you do this, though, take a moment to think about what you might need to grab the next time you open the self-storage space – specific paperwork? An heirloom you’re saving for your brother who’s on leave next month? Is there anything you might need from short-term storage in an emergency? Whatever your situation, move the items you may need soon to the front of the unit so they are easy to access. 3. Create a path from the front of the unit to the back. Murphy’s Law guarantees that you will need something from the back of your self-storage unit soon after you move everything in. Leave enough room between stacks of boxes and furniture to let you get to everything without causing a major pileup. To give yourself some room, look for unused space to store items, such as inside desk and dresser drawers, or take the legs off furniture to store it more efficiently. 4. Take photos of each wall of the storage unit before you leave. People often rent self-storage spaces during times of change – a home remodel, a move, a family situation, or a business boom that requires more room fast. After a long day of moving furniture and lifting boxes, renters are often too tired to remember where they put things. Photos are the answer. Use your mobile phone or a camera to take pictures of each wall of your self-storage rental, so you will know exactly what you placed in it – and where it is inside. If your belongings fill the entire space, take pictures in stages to capture all of the labeled boxes, furniture, and other items. This tip takes less than 5 minutes to do, but it can save you from making trips to the short-term storage facility trying to find something that isn’t there. At Bargain Storage, we pride ourselves in having friendly, helpful staff at every location. If you have questions about the right size self-storage unit to rent or the best strategies to organize your belongings, contact one of our experienced team members today!